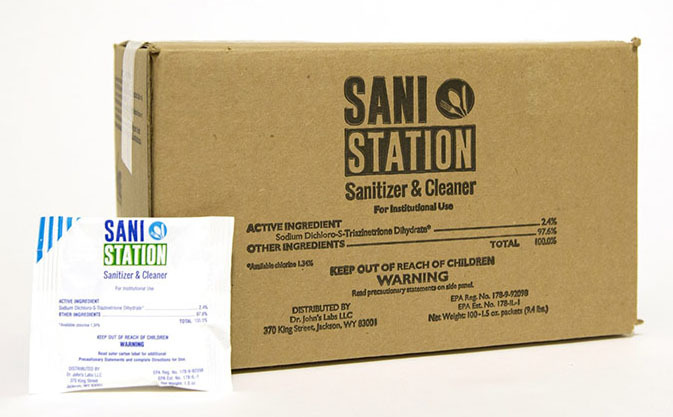 The Sani Station uses a pre-mixed blend of food-safe sanitizer to keep your kitchen utensils clean and sanitized. These no-rinse, food-grade sanitizer packages give you the exact charge each time you need to sanitize your tongs, spatulas, turners, peelers, and other kitchen utensils. Perfect for restaurants and other commercial kitchens, Sani Station’s no-rinse, food-grade sanitizer comes pre-packaged in easy to use packets. You’ll always be sure you have the exact chemical mixture, so you won’t have to worry about incorrect measurements or accidental spills. To keep the line moving smoothly, the Sani Station is designed with clear markings that help you quickly and easily mix the sanitizer. Our food-safe sanitizer is EPA and NSF approved.